This post was meant to go live last night but unfortunately I became quite suddenly ill, so I’ve spent the last 20 odd hours just lying in my pyjamas, drinking cough syrup and feeling generally quite awful. That’s probably the universe giving me a sign that I need to calm down a bit and try to juggle fewer things on a daily basis but… what can I say, stuff has to get done. But onto the brownies: I can’t believe it’s taken me this long to make mocha brownies, since I rarely drink coffee but when I do I usually go for a mocha. I’m a total chocoholic, but adding just a dash of espresso gives the chocolate a heightened quality – not like a normal latte, with more depth than a regular hot chocolate. That’s what these brownies are: proper chocolate brownies but with that va-va-voom that will just make people swoon! I’m not personally a fan of fudgy brownies – if I wanted fudge, I’d have made fudge! But obviously brownies shouldn’t taste like a sponge; these are more on the cakey side, but far from a traditional chocolate cake. These mocha brownies are moist, uber-chocolatey, soft and, get this – they’re actually pretty light. I’m the type of person who can’t resist having a few pieces at once, but these brownies don’t feel sickeningly heavy, which is something that usually puts me off as it doesn’t make the food enjoyable. Pre-heat the oven to 180ºC (350ºF/gas mark 4). Line a rectangular baking tin (21x28cm/8.5×11 inches) with parchment paper. Place all the dry ingredients in a bowl, then set aside for now. In a large bowl, cream the butter and sugar together; you can do this by vigorously whisking by hand or with an electric whisk. Add the hot coffee, almond milk and vanilla extract. It will all look a bit messy, but once you fold in the dry ingredients it all comes together. Add the dry ingredients to the wet and gently fold them in. The batter should be thick but still fairly liquid. Pour into the lined cake tin and bake for about 40 minutes. Cool on a wire rack before slicing into 20 pieces. 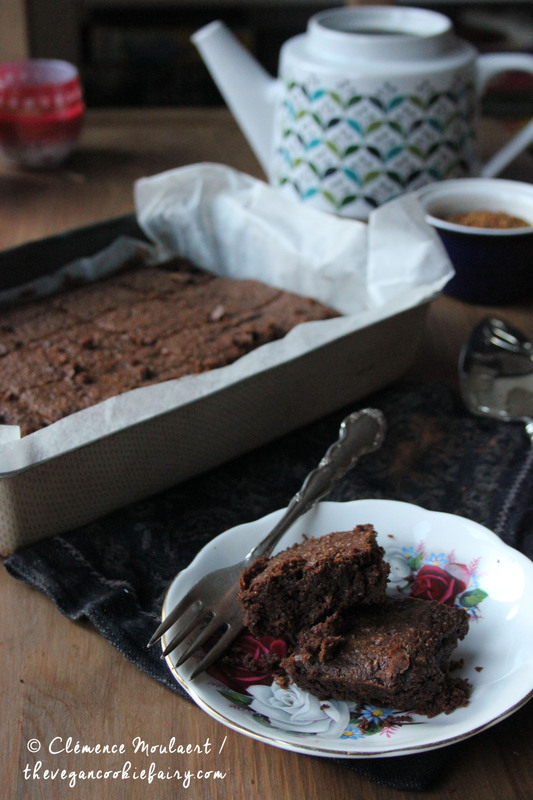 What’s your type of brownie – fudgy or cakey? These look amazing and easy too! 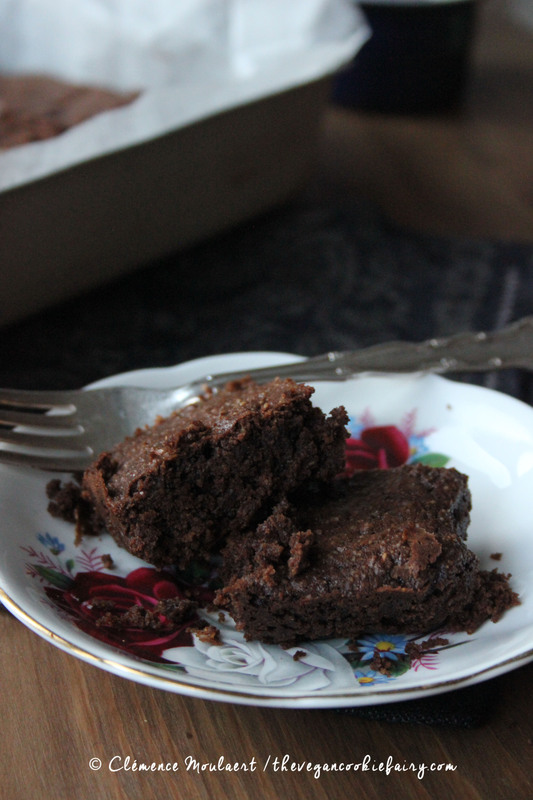 My favorite brownies are in between cakey and fudgey but honestly ALL vegan brownies are my favorite kind of brownies! Looks delish! Spelt flour isn’t easily available where I am. Could I replace with oat flour or regular white flour? Spelt flour is somewhat denser than regular white flour but I have used both interchangeably in many recipes and it usually works out fine. Otherwise use wholemeal flour.